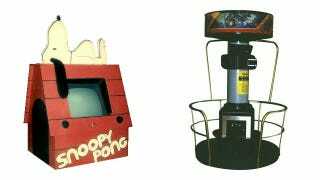 Companies like Sega and Namco tend to get all the credit when it comes to weird and wonderful arcade cabinets, but even all the way back in the 1970s, Atari was trying its hardest to be different. To that end, it came up with a number of prototypes for cabinets that went a little further than just a wooden box with a TV monitor inside it. Like a Snoopy game which you played in a replica doghouse. Or, even cooler, this rig for submarine game Wolfpack, which simulated an actual sub's periscope, and even had the player rotate the scope to change their view (the TV was located at the base of the central column, so it even worked like a real periscope). Of course, these were being made at a turbulent time for Atari, one which saw big changes for them just as the bottom was falling out of the arcade business. So many prototypes, including radical visions for Battlestar Galactica, Gremlins and Last Starfighter games, were sadly never realised. You can read more about these projects at the link below.